Robert Schumann, 'a dreamer, a [...] tone poet and writer whose inner voices were those of childhood, of wonder, of love, of turmoil, even of madness' was renowned for the passion with which he accorded many of his compositions. The works on this disc contain the outpourings of his imagination and soul, particularly in relation to his beloved Clara. His Fantasiest�cke Op.12 were a favourite of Franz Liszt, the title taken from ETA Hoffmann's Fantasiest�cke in Gallots Manier - a collection of writings in the style of the 17th-century French engraver Jacques Callot. Among the pieces are depictions of Schumann regulars such as Eusebius and Florestan, but many reflect Schumann's long fight to wed the young Clara Wieck. No.5, 'In der Nacht', likens their plight to that of Hero and Leander. The disc also contains the mysterious and atmospheric Waldszenen Op.82, the playful Kinderszenen Op.18 and Arabeske Op.18. 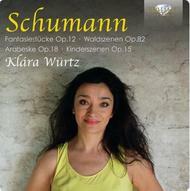 One of Brilliant Classics' most prolific artists, Hungarian pianist Kl�ra W�rtz is enjoying an international career. Having won prizes in Dublin and Milan, she signed to a New York-based management company, leading to performances at Carnegie Hall and other prestigious concert venues throughout the U S and Canada. She currently teaches at the Conservatory of Arts in Utrecht.